Almost six thousand Palestinians are currently detained in Israeli prisons, most are charged with “security-related offenses,” and conviction rates hover around 95 percent. Lawyers who take on Palestinian cases go up against a system of occupation that’s considered illegal by international law. However, Gaby Lasky, an Israeli lawyer who fights some of the toughest legal battles on behalf of Palestinian clients, says it’s her moral obligation. It was the slap and kick that went viral. 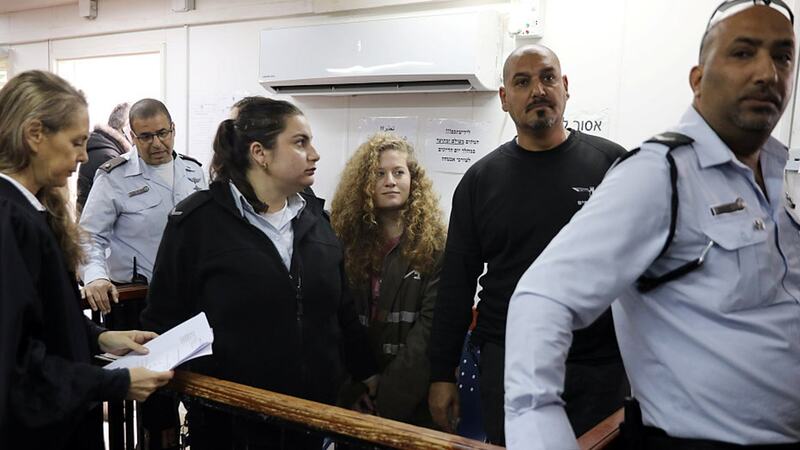 And landed Palestinian teenager Ahed Tamimi in Israeli military prison for eight months while some Israeli ministers were calling for a life sentence. Gaby Lasky secured the lesser sentence. She has been representing Palestinians in Israeli courts for twenty years. Mohammed Khatib, another client of Lasky, is also an attorney and an activist. He’s up for indictment on charges of assaulting a soldier, participating in a non-approved march and obstructing justice. Lasky, a former Israeli army officer, today is considered a traitor by many Israelis. She said she is dancing with the wolves and has gotten threats, but she doesn’t back down. Israeli forces detained at least seven Palestinians, including a lawyer, in multiple overnight raids across the West Bank, said the Palestine Prisoner’s Society (PPS). Israeli military vehicles raided the northern West Bank city of Jenin, where soldiers detained three Palestinians after storming their families’ houses. PPS confirmed that Israeli forces detained two Palestinians, including a lawyer, from the northern West Bank district on Nablus. In the southern West Bank, PPS confirmed that two Palestinians were rounded up from Bethlehem district. Israeli forces frequently raid Palestinian houses almost on a daily basis across the West Bank on the pretext of searching for “wanted” Palestinians, triggering clashes with residents. These raids, which take place also in areas under the full control of the Palestinian Authority, are conducted with no need for a search warrant, whenever and wherever the military chooses in keeping with its sweeping arbitrary powers. At 9:53 a.m. on July 18, 1994, in Buenos Aires, Argentina, a suicide bomber in a Renault van detonated more than 600 pounds of explosives near the entrance to AMIA (Argentine Israelite Mutual Association in English), a five-story center that has, for generations, provided and sponsored a variety of crucial services for the largest Jewish community in Latin America. The terrorist killed himself and 85 people who were in or near the Jewish center and injured hundreds. In the nearly 25 years since, there have been trials, accusations, public demonstrations, private lawsuits, volumes of testimony, videotaped bribery, at least one suspicious death and countless articles about Argentine malfeasance and the suspected involvement of Iranian, Hezbollah and Hamas officials. To date, no one has been convicted. “Justice” and “impunity” were key words in a symposium about the incident, held on Feb. 21 at Southwestern Law School in Los Angeles. The event, “25 Years After Argentina’s AMIA Bombing: Justice vs. Impunity,” featured American and Argentine speakers, mostly attorneys, many of whom have been personally involved in unsuccessful attempts to fully learn the facts and hold the perpetrators and their allies responsible, whether in Iran, Lebanon, Syria or Argentina. The Ofer military court in the West Bank released on Wednesday Amal Barghout, the wife of an attorney who was arrested in Ramallah last week alongside a senior figure in a Fatah-linked militant group. Tarek Barghout has been undergoing questioning by the the Shin Bet for the past week. Amal Barghout was arrested early on Tuesday morning. About 30 Palestinian and Israeli lawyers immediately filed motions calling for her unconditional release, arguing that there were no suspicions against her and that her detention was designed entirely to exert pressure on her husband. Tarek Barghout was arrested alongside Zekariya Zubeidi, a senior figure in the Palestinian Prisoners’ Ministry, formerly of the al-Aqsa Martyrs Brigades. Both are suspected of recent involvement in terrorist activity, according to the Israeli military spokesperson’s office and the Shin Bet. Israeli and Jewish leaders on Friday marked the fourth anniversary of Argentine federal prosecutor Alberto Nisman’s murder by unveiling a memorial plaque in his honor at the Ben Shemen forest in central Israel. Nisman’s body was discovered in the early morning of Jan. 19, 2015 — hours before he was due to unveil a complaint against the former government of President Cristina Fernandez de Kirchner over its alleged collusion with Iran in effectively exonerating the Islamic Republic of responsibility for the 1994 bombing of the AMIA Jewish center in Buenos Aires, in which 85 people were murdered and more than 300 wounded. Nisman had been investigating the AMIA atrocity since 2005, with his efforts resulting in the global law enforcement agency Interpol issuing six “red notices” in 2007 for the Iranian and Lebanese Hezbollah operatives believed to have planned the attack. Kirchner’s government falsely maintained that Nisman’s assassination was a suicide until an independent police investigation in May 2017 established beyond doubt that the prosecutor had been murdered. More recent efforts within Argentina to bring Kirchner — who is now a senator — to trial over both the alleged AMIA cover-up with Iran and Nisman’s murder have so far failed. 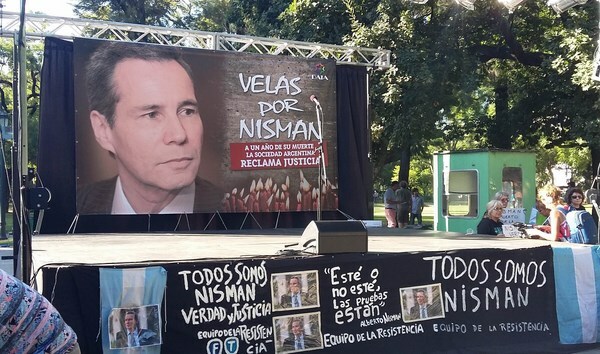 The KKL-JNF (Keren Kayemet L’Israel-Jewish National Fund) will inaugurate a monument in memory of Alberto Nisman, the Special Prosecutor murdered while investigating the 1994 car bombing of the Buenos Aires Jewish Center by Hezbollah terrorists. On the fourth anniversary of his tragic death, Keren Kayemet L’Israel-Jewish National Fund (KKL-JNF; http://www.kkl-jnf.org/) will unveil the monument built in Alberto Nisman’s honor in a formal ceremony with officials from both Israel and Argentina. The ceremony will take place on Friday, January 18th, 2019, at 10:00 at the Israel-Argentina Friendship Forest, Ben Shemen Forest (http://www.kkl-jnf.org/tourism-and-recreation/forests-and-parks/ben-shemen-forest.aspx). Alberto Nisman was the leading prosecutor in charge of the investigation into the terrorist attack on the AMIA (Asociación Mutual Israelita Argentina) Jewish community center in Buenos Aires in 1994 which claimed the lives of 85 people, and he accused the Argentinian authorities of having covered up Iran’s involvement in it. In 2015, just hours before he was due to testify before the Argentinian Congress, he was found dead at his home. Although the mystery of his death has never been solved, the presumption is that he was shot in the head in the course of a murderous assault that was disguised to look like suicide. Para el fiscal de Cámara, Nisman “ha sido víctima del delito de homicidio”. Y pidió que la causa pase al fuero federal. El fiscal Ricardo Sáenz dictaminó hoy que Alberto Nisman fue “víctima del delito de homicidio”.Además, el fiscal general de la Cámara del Crimen pidió que la investigación de su muerte pase a al fuero federal. Para Sáenz, “el objeto procesal de esta causa hasta el momento, lo constituye la hipótesis de que Alberto Nisman ha sido víctima del delito de homicidio”.